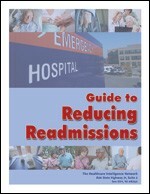 The Guide to Reducing Readmissions examines eight top tactics that healthcare organizations are using to reduce readmissions, according to responses to the Healthcare Intelligence Network 2010 survey on Reducing Readmissions. Learn how early adopters are utilizing these tactics to empower patients and improve the quality of healthcare delivery. Order your Instant PDF download or print copy today.